Elizabeth Jennings Graham, activist and educator was born free in New York City to Thomas and Elizabeth Jennings in either 1826 (according to her Death Certificate) or 1830 (according to an 1850 census). The specific day and month of her birth are unknown. Her parents were both prominent members of New York City’s small black middle class and her father was the first African American to hold a patent in the United States. He was also involved in many social and religious organizations and was one of the founders of New York’s Abyssinian Baptist Church. Like her father, Elizabeth Jennings Graham was involved in many social and religious organizations, most prominently as a church organist. 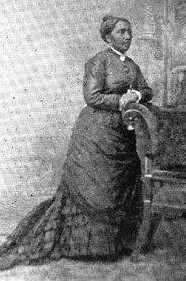 She was on her way to church to play the organ on July 16, 1854 when she tried to board a streetcar of the Third Avenue Railway Company which at the time did not allow African Americans as passengers. At first she was given permission to ride the streetcar as long as none of the other passengers complained, but was forcibly evicted as soon as the conductor found a policeman to help him throw her off the conveyance. Graham’s forcible removal from the streetcar because of her race caused a massive protest against the streetcar company by members of New York’s African American community and others who felt she was unfairly treated. Support for the protest came from across the country, including from as far off as San Francisco. Elizabeth’s father Thomas Jennings hired an attorney and future president Chester A. Arthur to sue the Third Avenue Railway Company on his daughter’s behalf. At the time, New York City and New York State had no laws regarding segregation on streetcars. Consequently, the court ruled that it had been illegal to forcibly evict Graham solely because she was African American, and awarded her $225 in damages. Her case itself did not lead to total desegregation of all streetcar lines, but it did set a precedent for future trials. After the trial, Graham continued her career as a church organist and her career as a teacher. In the late 1850s she married Charles Graham. In 1862 the couple had a son named Thomas who died of “convulsions” one year after his birth. Her husband died four years later in 1867. Later in life, Graham opened a kindergarten for African American children in her home. The kindergarten operated from 1895 until her death on June 5, 1901. Elizabeth Jennings Graham was buried in Brooklyn’s Cypress Hills Cemetery, along with her son and her husband.